Though Chinatown is only a ten minute walk from Downtown, depending on what event we’re running to, sometimes it is an additional distance we don’t have time to travel. That wasn’t the case on Thursday, when both the weather and our schedules were cooperative, with our Global Visions screening at Paramount falling at 8 (on a sidenote – I don’t like the trend of plays moving their start times to 7:30. I like the option of lingering at dinner). As a result, I was finally able to return to Boualouang, many months after my first visit, and six months since the restaurant relocated down the block to a beautifully-renovated space. 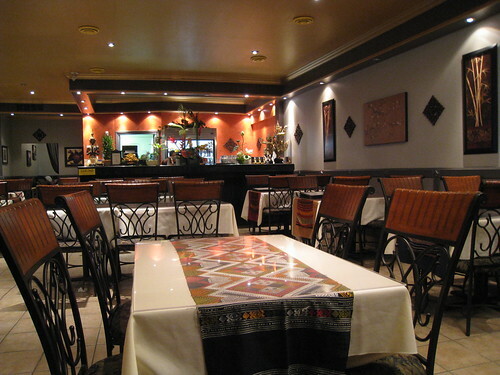 While the original location was functional and well-kept, it was bland and visually unattractive. This new venue better suits the wonderful food produced by the kitchen, and of course, provides the owners with a few tables to spare (they seemed to be forever turning people away at the previous restaurant). I especially love the lavish blue drapes that help separate the room from the bustling world outside. I was very tempted to order a dish I hadn’t yet tried, but the side of me seeking a familiar, reassuring meal eventually won out. 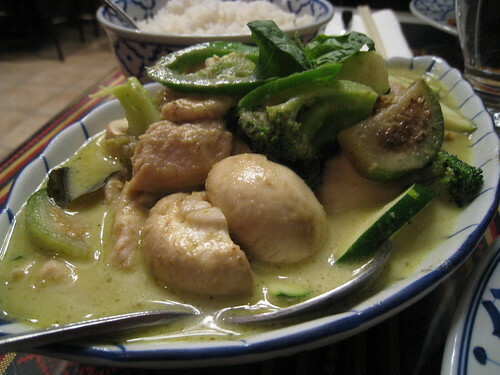 I couldn’t complain though – their green curry is (in my opinion), the best in the city. The chicken was tender, drenched in a sauce lovingly prepared with flavour that was worth the heat (which is saying something for a person who usually stays away from spice). We ended up ordering an additional bowl of coconut rice to soak up the curried goodness, and kept our server busy who insisted on keeping our water glasses filled to the brim. 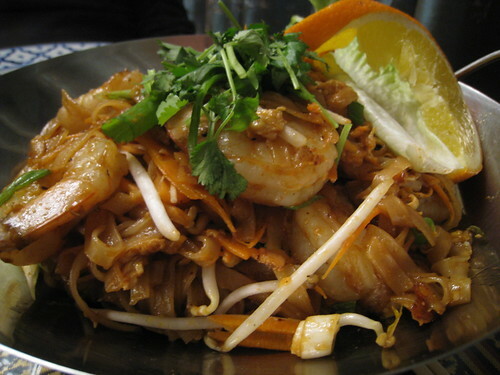 The pad thai was also great, with a serving size that blows me away each time. Mack loved the grilled shrimp (and surprisingly) the tofu strips, and though isn’t a big fan of the sweet and spicy profile of the dish, was willing to overlook it for me. We were both stuffed, with leftovers remaining. For just over $40 (including tip), we were treated to a satisfying, relaxing meal with time to spare before our next engagement. If you’re in the area, be sure to keep Boualouang in mind.